A wild and erratic plane ride over the Jersey Shore caused neighbors to panic. 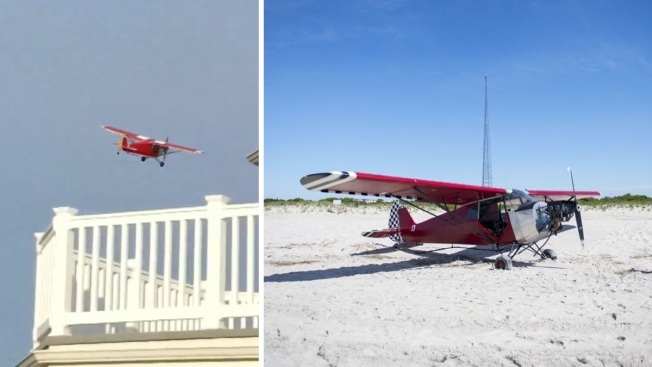 That flight landed on a coast guard beach in Cape May and no one could find the pilot. A man who illegally landed a single-engine plane on a Coast Guard Beach in New Jersey has yet to turn himself in, officials said. The plane is from Paramount Air Services, which runs banner planes with advertisements along the Jersey Shore, owner Barbara Tomalino said. "This is just so bizarre," Tomalino told NBC10's Lauren Mayk. Jimmy Dahlen Jr. is a mechanic for Paramount Air Services, the banner plane company that owns the Piper PA12. The company's president — who is also Dahlen's stepmother — tells The Press of Atlantic City that the 50-year-old Cape May man stole the plane sometime Sunday night, though it's not clear why. Witnesses spotted the plane flying erratically around Wildwood Sunday afternoon. Around 8 p.m., it landed in the restricted beach area. The Coast Guard has surveillance video of the pilot leaving the scene, they said. "Take responsibility and come home," Tomalino urged her stepson. Authorities didn't reveal what charges Dahlen, who is a student pilot, could face.